I LOVE Halloween, I love scary things, I love treats, I just love it. - Preheat oven to 150 C (or 375 F) line muffin cups with papers. - Mix the butter and sugar together 'till it's light and fluffy. Add the eggs. - Add flour (mixed with baking powder and salt). Add the milk while you blend. Stir in vanilla. 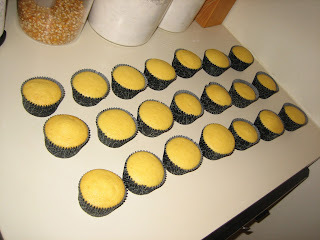 - Put it in your cupcake case (this is how I call it ok) an bake them for 15 minutes. blueberry05. Simple theme. Powered by Blogger.